You are here: Home > BlackBerry offering T-Mobile subscribers with $100 off device purchases at ShopBlackBerry? BlackBerry offering T-Mobile subscribers with $100 off device purchases at ShopBlackBerry? BlackBerry might have ended its licensing agreement with T-Mobile, but that doesn’t mean it doesn’t want Magenta-carrier customers using its devices. In an effort to get them to buy brand new BlackBerries direct from the company, it started sending out emails to T-Mobile customers, offering them $100 off purchases at ShopBlackBerry.com. Email recipients have been offered a $100 coupon code for use on the BlackBerry Q5, Q10 and Z10 and it’s limited to one use per customer, and is set to expire on May 31st, 2014. That’ll take the Q10 down to $299, the Z10 to $199 (unless it doesn’t include the already discounted price, then it’ll be $299) and the Q5 to $249. Let us know if you received an email. We’d love to see it in detail, so hit me up on cam@tmonews.com if you did. Any of you planning on taking advantage? Are you one of the tards of re that want BlackBerry to go out of business? That’s only going to hurt the consumer, the more competition the better. Trust me everyone is trying to copy what BB10 is doing now with innovation. I know you’ve never used one so you have no clue. Are you one of those Tards that wants Blackberry to stay in business? Thats NOT going to benefit the consumer because Blackberry is GARBAGE PERIOD!!! Now many many years ago they were an actual competitor, but now they are a joke. If you like them so much then don’t mark them as spam, LOL. Im not on here to argue, that was simply my opinion. You have never used the new software or devices so how would you know their garage? I don’t base my decisions off market share. I tried a Z10 and a Q10 for about a week and hated it. BB just isn’t the business. I don’t base my decisions on market share either but it is a good indication the company is doomed. I guess we agreed to disagree. Wow, is BlackBerry desperate! Then again, considering their position, it’s not surprising. I do not think this will help BlackBerry much but hopefully it starts a trend with the other manufacturers. Apple already does this as well as Motorola. Locked/branded phones primarily available through the carriers and exclusivity deals is what is keeping prices inflated. Oh the tangled web they weave…..
Too bad scamming ***holes ruined the Blackberry trade in forever. And if I were Johnny Boy, John Chen that is, I’d set up a way to give every T-Mobile BlackBerry user their IMEI unlock code, making it even easier to jump on over to at&t. As a long loyal BlackBerry fan who eventually got tired of waiting for them to get their act together while Android and Apple kept impressing me with their innovation, I feel terrible they are going through this. I hope to god they make a comeback and this time strong. I personally love the new BlackBerry 10 OS, I tried the Z10 and was amazed how awesome it was in particular the HUB. I do miss BlackBerry though, we’ll see what they cook up for their next round of phones and I might jump ship. Their problem is that they’re always behind the power curve. They announce something or some product is leaked and they never follow through. I loved my PlayBook but they never relaed a BB10 version with upgraded specs which would have rocked. They never released a dock with HDMI out. They leaked a dock with HDMI, LAN connection and USB ports a long time ago for the PlayBook and they never released it. That sent me over the top. This is the kind of crap that has BlackBerry where they’re at now. They keep letting their loyal fans down. If BB10 would have been released 2 years earlier, I think it would have made a difference. I haven’t tried 10.2.1 where you can supposedly download Android apps directly but I’m curious to try it. I’m using the Z30 on T-mobile (bought it on shopblackberry) and it’s a great device. Long battery life, fast, quick, and I get thing done way faster than other devices (and I’ve used all the other OSes). Still not heard from anyone who’s actually received this offer. Doesn’t seem like many got it. Or.. it went straight to spam folders? Haven’t received anything and I’m using a Q10 on TMO. 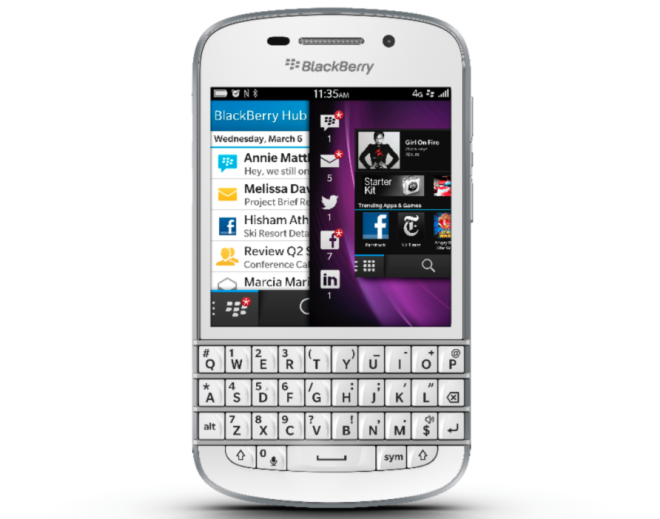 Home > BlackBerry offering T-Mobile subscribers with $100 off device purchases at ShopBlackBerry? Blackberry $100 off, The promo code is BLACKBERRY1. What is the homes website? I rarely shop online so any help would be appreciated. Forget $100 off, you’d have to pay me $100 to bother getting a BlackBerry. Don’t forget to give you the phone for free too lol. It would be a terrible business move to completely cutt off a carrier’s customers. Smart of them to make an offer like this but is it worth it for their current devices? @cam, the discount takes the Z10 to $199. T-Mobile does not push any units, they’re not in stores, the sales reps won’t offer them and in fact if you go there wanting one they will try to sell you something else. Someone else here said that they take them off of their website all the time. T-Mobile will lose more customers than BlackBerry will. Verizon will be knocking on doors of any T-Mobile enterprise businesses that still use Blackberries and offers them promotions and discounts to switch carriers. Which will be easy because Verizon will do all the leg work. Most consumers will also probably switch carriers and pick up a new BlackBerry phone from the store for cheap with the $100 promo. Most companies, I’ll be it not all, have switched to iPhones for business. That eliminates the mass potential customers any carrier would gain from selling BB for business. I agree that someone will pick up the slack, but it won’t be enough. Wouldn’t it have worked a lot better for BlackBerry sales if they had just made the latest and greatest BlackBerrys available to T-Mobile customers from the very beginning? If this story is true, I feel really happy for my CrackBerry friends who still love their phones on T-Mobile. Ending the sales agreement with T-Mobile will actually be better for BlackBerry customers on the carrier. T-Mobile did not carry any BlackBerry phones in-store, so it’s not like you could walk in and buy one anyway. Additionally, BlackBerry devices would disappear from the website for weeks at a time and half of the phone reps would tell you T-Mobile did not carry any BlackBerry phones. With the sales agreement gone BlackBerry doesn’t have to pay the massive fee to T-Mobile to carry their phones and can sell all the devices directly on their own website where they will assuredly always be available. The cherry on top? BlackBerry’s direct pricing is over $100 cheaper than anything T-Mobile ever offered (aside from the $250 trade-up a few weeks back).